Comment: I’d known Doraemon for as long as I could remember. He was big part of my childhood as a friend, escape and inspiration. The Doraemon movies were made every year since 1980 and I loved them all. 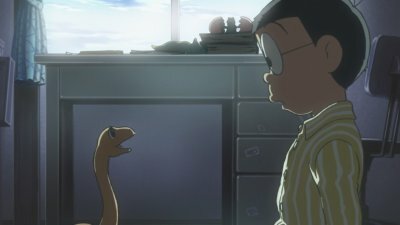 Doraemon: Nobita’s Dinosaur 2006 was actually a remake of the first movie. 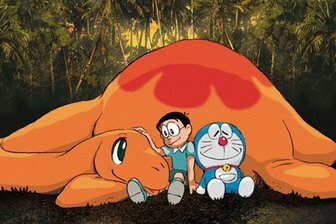 It follwed Nobita, Doraemon and friends on their quest to bring Pesuke the dinosaur home and save it from the hunters. What I like most about this movie was that the director knew that he was remaking one of the most loved Doraemon films. 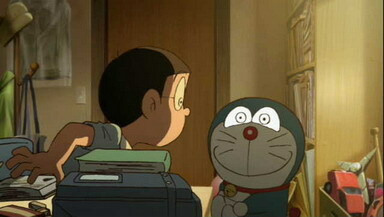 This version followed the original very closely and was able to preserved the magic of the Doraemon franchise. There were some good changes made in this remake. The most obvious was the animation which was lively, colorful and, thankfully, was in beautiful 2D not in lifeless 3D. 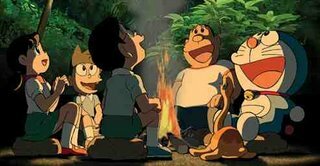 The scene in which Nobita and friends flew across great ancient landscape was simply breathtaking. I felt like I’d just walked out from some dark basement into the open field with cool breeze and sunny sky. The houses and the neighborhood in the movie had more modern looks. Environmentalism was also added to the movie in the scene showing the villain’s ship left its waste and fuel on the ground causing contamination. There were also a few things I didn’t like about this movie. The joke about Giant’s singing that attracted the T-Rex was missing. The ending sequence, though visually stunning, was somewhat incoherent and confusing. The original movie could not be outdone but this remake cleverly kept most of the good parts from the original and successfully breathed new life into the franchise with refreshing animation and many nice new additions. This new Doraemon was still the old friend I’d known and loved for so long and it was always good to see him again.